A place to watch me stumble through playing this game. A little round up of the tournament I last attended. Just a few thoughts on the initial pairings for the upcoming tourney in Leeds. So for those of you wondering I have a tournament to attend at the end of next week. I am going to try and cover as much as possible of it and do a video on the lists and how I think they will perform. This will be on my youtube channel which is named Max Pounder Reports (go subscribe and you will get to listen to my lispy english accent, what more could you want?). Also check out @Maccamonger he also has a channel (spotty dog wargaming?) and has already done some coverage on it. If you have been watching my battle reports lately you will see I have been trying to perfect a UD triple kitty-cat list. Mostly losing games with it but having fun with it nonetheless. Therefore since no one was taking DE to this tournament I was tempted to take my dragon list, that if you see my earlier battle reports, I am very experienced with. However I had some models that needed finishing off in terms of painting so I opted to take my UD to force myself to finish them and also give myself an apt challenge. And finally I now feel like I have stumbled upon an army that works and shall prove victorious in the upcoming war (if nothing else they are one of my better painted armies and colour scheme so I am gunning for best painted if things go sour quick, I am looking at you cannon empire). 3 Skeleton Chariots: Light troops. 10 Archers: Standard and Musician. 15 Archers: Standard and Musician. 3 Sand Stalkers: Champion, Underground ambush. 4 Tomb Cataphracts: Standard Bearer. 4 Winged Reapers: Paired Weapons. The main difference between this and other UD lists is I have taken nothing that is static, or if it is I do not care about it. The strength of the kats is their durability but I was missing punch, even with a tooled up Pharaoh, hence the inclusion of winged reapers and also the decision to not ambush the cataphracts (although I really wish I could have found 10 pts for Mu but i really wanted the 4th body). 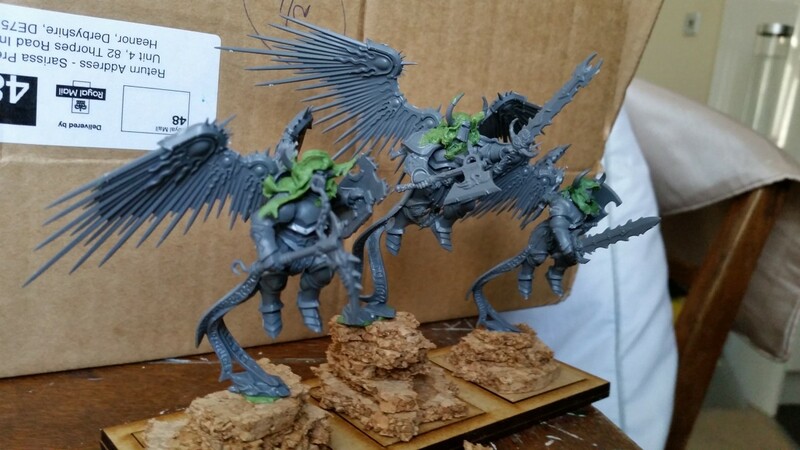 Since the general is so tough to get rid of you have an 18'' bubble with which to play hyper aggressive and no one wants 3 sphinxes shoved down their throat whilst a big unit of winged reapers fly around the flanks. Another change I made is the decision to bunker the wizard in a fast cav bunker. In the test games I was finding the range of the path of sands too little to keep up with the monster threat and so since the wizard just wants to sit behind to keep 6'' in range to heal things I needed him mobile. Which if the enemy lacks shooting I can play him solo or if they do possess it in the cav bunker who have 18'' move who then lose light troops but can score. I also made the change from arcane book of power to a dispel scroll since I no longer have a casket, although I do miss the +3 to cast. All in all I like the list and am more comfortable playing it now. I think it will end up being match up dependent, either you will handle the monsters and will mostly likely win or you won't and will most likely lose. Here it is my Undying Dynasties makes its first appearance. 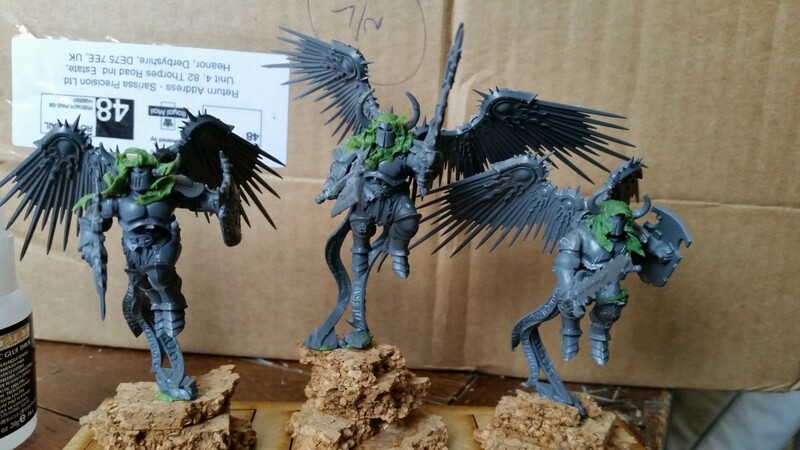 A little insight into the beginnings of my Warriors army, displaying some one chosen of lust. 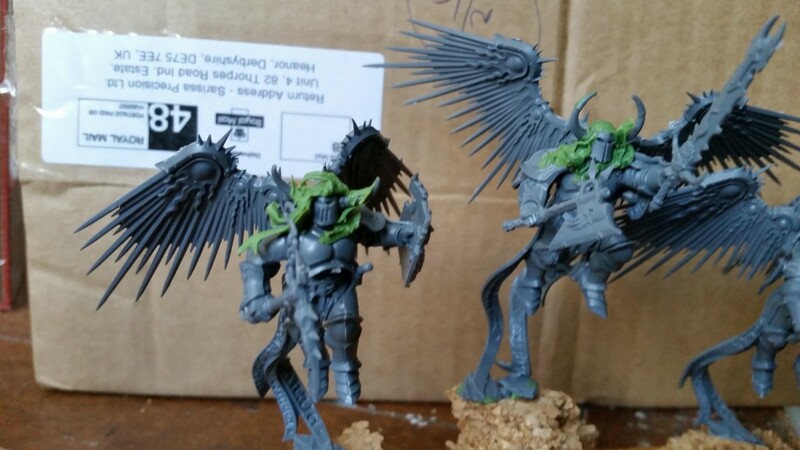 The armour needs more battering and the wings might possibly be experimentally burnt or one taken off in order to give a more one winged angel look (ala sephiroth). Other than that pretty pleased with it. Hoods might need a slight remould and some more fabric added at the armour joints.